While registered students are automatically enrolled into your SNAP course, you can manually enroll extra participants, such as a Teaching Assistant or Guest Instructor. 1. Click on the Admin. 2. 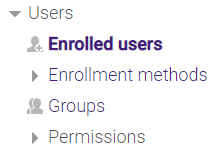 Click on the Users and then select Enrolled Users link. 3. 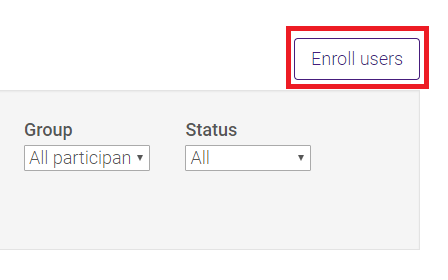 Click the Enroll Users button. This will open the user search window. 4. The “Assign roles” pull-down menu in the top of the window lets you choose the desired role for the participants. 6. Type a name or PAWS ID (the first part of the person's LSU email address) in the Search box at the bottom of the window and slick the search button. If you click the Finish enrolling users button, the search window will close without searching. **NOTE: If the name of the participant does not appear and you see the message 0 users found, check to ensure you have entered the correct PAWS ID. If the PAWS ID is correct, contact the participant and ensure they have logged into the system. Once they log into Moodle/ Community Moodle, their account will be generated and you will be able to add them to your course.